Although I agree with everything else in this post, please do not grant a high stealth detection level to camera droid spectators. In fact, please remove the low stealth detection that it already has. The possibilities of stream sniping will ruin any tournament. 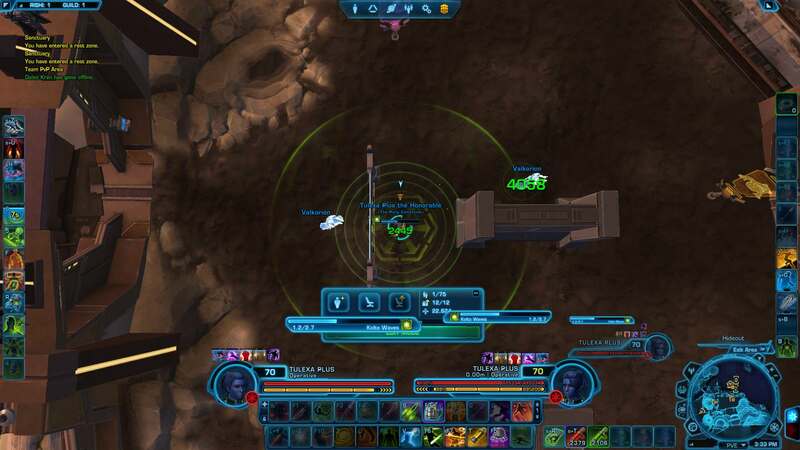 1 player, who is spectating the match on a camera droid, can be in discord with the players playing the match and reveal the location of all stealthers. I tested the camera droid, and it appears that the camera droid can see players with a low stealth detection (about 3-5 meters). 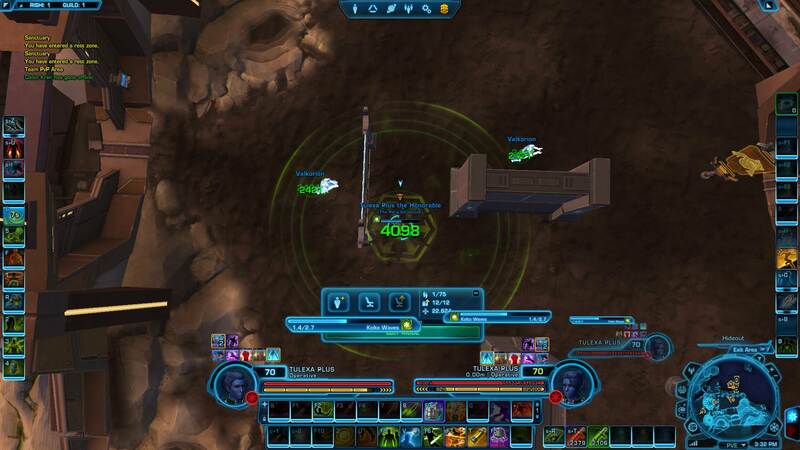 This is enough for a camera droid to follow a player in stealth, see them, and report their location. Please remove it. I agree here. In the age live streaming, the developers need to look at what they're doing in the broader context than just the game itself in cases like this. I have to agree with those who think Stealth detection should be linked to a Silver key. Just please don't link it to a Gold key -- just because I trust them not to ruin a PvP match doesn't mean I want them rearranging my decorations. This is the same elevator functionality as the elevator that goes to the VIP section of the fleet. Probably a cut and paste from that with a new surface texture. Have you never traveled to the VIP lounge on fleet? It's the exact same thing. If you complain about one elevator, complain about the other. DEVS: DO NOT change this elevator. It works just fine and it does what it needs to do and we don't need to be slowed down getting to where we need to go. 100% disagree. The fast elevator is distracting as the apartment should be a place where you can relax. But there are ways to make it work without changing much, the prefered option would be to add a pad that controls the elevator so that it moves manually instead of automatically. And no, elevators in strongholds are not the same as elevators in crowded areas. If you have guests in the stronghold they wouldn't appreciate it to be shot up or down. The PvP toggle doesn't seem to be working properly. Even though it is unchecked by default, your stronghold is still set to PvP. You have to click it on and then off again for PvP to be disabled. Also, it is not remembering your setting when you log off. Every time you log in, you have to check PvP on and then off again for your stronghold to not allow PvP. It took me a while to work out where to look to toggle PvP off/on (I'm a bit special ). I did not realise it was in the stronghold UI - I was running round looking for a button or terminal in the stronghold. After reading the above post I realised it must be in the UI, however I experienced the same issue. However once you enable then disable it seems to be working fine. As a stronghold decorator, I like this a lot - good job devs! EDITED TO ADD: Just found out you need to enable/disable EVERY time you visit your stronghold for PvP to be off. I'm guessing this will be fixed by launch? My last suggestions regarding the stronghold. I posted final suggestions for the apartment in it's thread. Please reduce the number of craters in the sand/ground or remove them entirely. Not necessarily a big issue but i think everyone would prefer if there's sand/dirt without those craters. When you walk/run on the small island and some parts of the beach the water level is above the ground which causes the characters to basically walk through water instead on dirt. Don't know how to explain but to sum it up, please lower the water level at that locations so that we are actually walking on sand/dirt not water. Please don't. I love running through the water on the beach area. Please add elevator/taxi symbols to the map for the speeder in the Cove Expansion, and the two speeders on the Sky Deck. An excellent solution. Please place the appropriate symbols on the map for the speeders and bind points. I didn't mean removing water effects at the beach but rather remove water at locations where it obviously should be dirt or sand only. Could we please add QT points to the spawn locations? The markers are already there...seems I need to set the spawn for any character I put, instead of one and done type thing. While I appreciate the individuality, It would be nice to set a universal one that a few might switch than having to set a default for each toon. Could we also add a default spawn in the options menu? 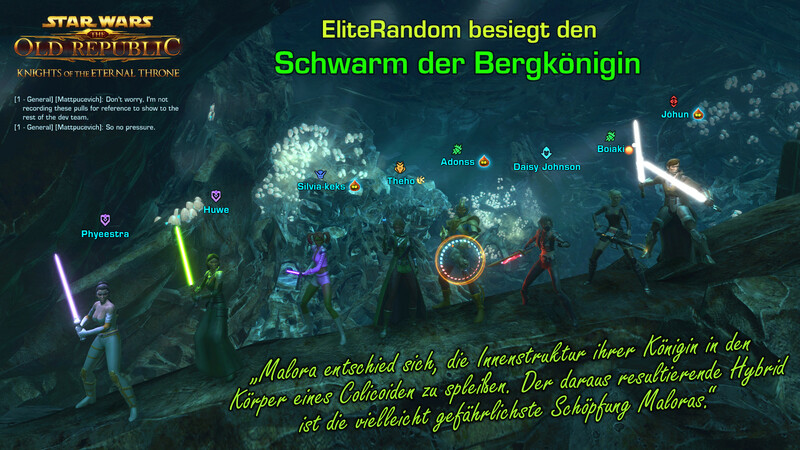 Would make it easier to invite groups if they could be directed where to spawn (for tournaments, huttball matches, etc. Especially new people might get lost, taking time from activities. Actually, there is a bigger bug related to line-of-sight. On Friday, we only tested if casts are interrupted by line of sight. We did not test if AoE effects go through line of sight. There's no one online for testing at the moment, so I healed NPCs instead. In this first screenshot, you can see that I am clearly out of LoS of both NPCs, yet they receive healing from Kolto Waves. In the second screenshot, I am standing in a different position, and you can see that my Kolto Waves don't go through the Imperial Wall. Apparently, only the center part is blocking LoS but not the sides. In the third screenshot, you can see that the center part of the Security Fence is blocking LoS; in the previous screenshots I could heal through it just fine. The decoration "Custom Huttball Stand" appears to be bugged. If you click on it, you now get the error message "Target not visible", no matter which stronghold you place it in. I am pretty sure that it worked in a previous PTS build. Please ensure that this decoration is working again. Also, I cannot click the "Jukebox: Galactic Mysteries" decoration, it shows "Target not visible". On the other hand, "Jukebox: Stellar Hits" works correctly. Frankly, it feels like I am the only one left testing PvP bugs and I don't have the time nor patience to go through every single decoration and check which ones work and which ones don't. 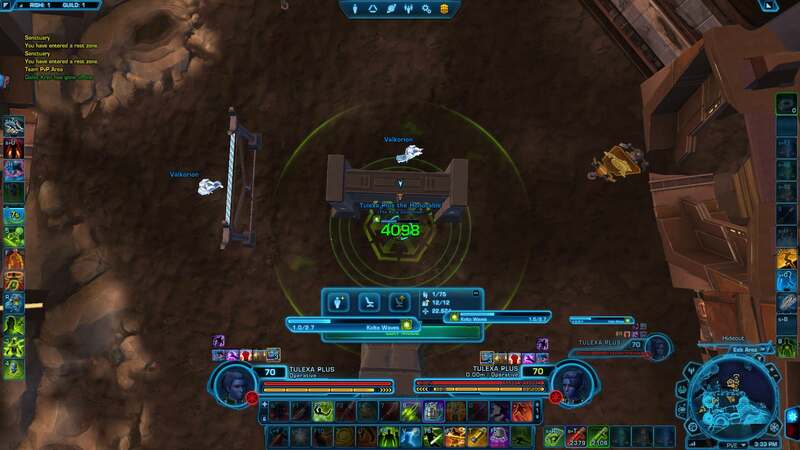 And I don't think I can motivate my guildies to test how AoE line-of-sight is affected by decorations; and even if I could, line-of-sight in SWTOR is still very much an open problem. We veteran player have figured out most of the positioning issues over the last couple years, but I am still not 100% sure how LoS works, so I don't feel capable to test it. All I can say is that: No, line-of-sight is not working correctly. It requires significantly more testing, more than I am able to do at the moment. This patch cannot go live, it is too buggy.